Just like last year, we signed up for the Shared Harvest Winter CSA this season. Gretta puts together local produce from several different farms, including Picadilly Farm, Riverland Farm, Busa Community Farm Moraine Farm, and Cider Hill Farm. Last year’s share was so plentiful, we opted for a two month share this year instead of the three we took last year. Our first delivery was the weekend before Thanksgiving. We were headed down to Maryland for Thanksgiving week on pickup day, so we picked up as early as we coulde, stashed our bounty at home, and headed the car south. We were in a hurry to get on the road (and the camera was packed) so I didn’t take a picture of the full assortment of gorgeous veggies. The share included potatoes, sweet potatoes, carrots, parsnips, turnips, butternut squash, leeks, cauliflower, Brussels sprouts, bok choy, garlic, onion, cabbage, lettuce, parsley, Jacob’s Cattle beans, and apples (Macoun and Mutsu). This year, there’s a swap area, so we traded lettuce and parsley for some extra Brussels sprouts and turnips which would last a bit longer than the week we were away. We took the spinach and Swiss chard with us. One night, I sautéed the spinach to go with dinner at my dad’s, and another night, I made the Swiss chard to accompany a dinner at my sister’s. Everything else had to wait until our return home. Back home, I thought a stir fry featuring the bok choy (the most perishable thing we had left) would be tasty. It would also be a relatively light meal after a week of hearty home-cooked meals, including Thanksgiving dinner, and many meals out. Taking inspiration for other ingredients already in the pantry and refrigerator, I mixed up a stir fry sauce lifted from a recipe in Didi Emmons’ Vegetarian Planet and stir fried carrots, celery, and mushrooms in addition to the two heads of bok choy. I served this dish over brown rice. First, make the stir-fry sauce by whisking together all the ingredients. Set aside. Heat the peanut oil in a large skillet over high heat. Add the garlic and ginger and cook until fragrant, about 30 seconds. 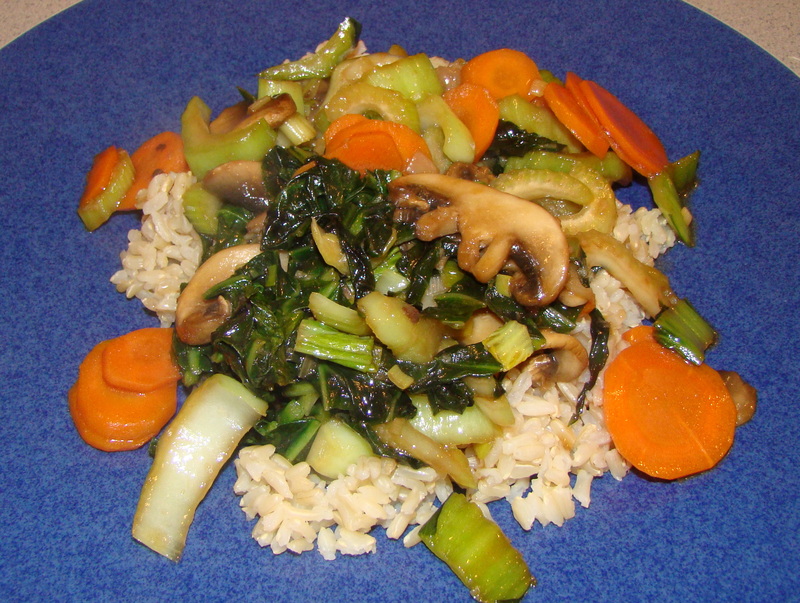 Add scallions, carrots, celery, mushrooms, and bok choy and cook until carrots and celery are tender, about 5 minutes. Add the stir-fry sauce and cook until it thickens slightly. Drizzle the sesame oil over the stir-fry and toss. Serve immediately over brown rice. 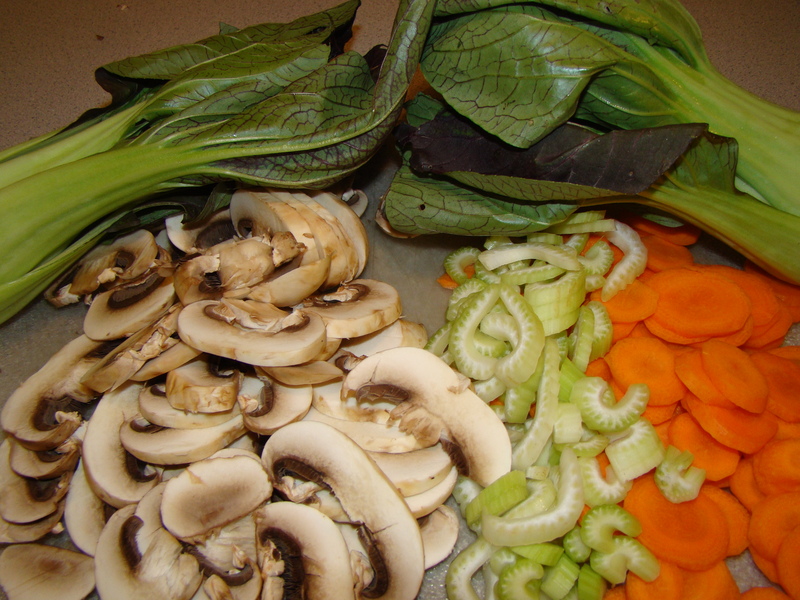 Posted on 29 November 2010, in Winter CSA and tagged bok choy, stir fry, Vegetables. Bookmark the permalink. Leave a comment.